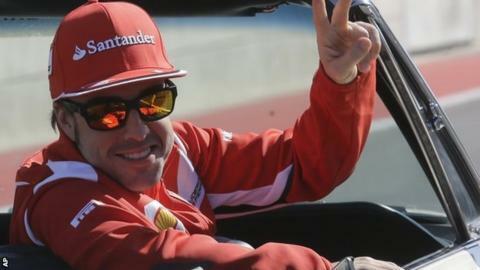 Ferrari's Fernando Alonso says he has "nothing to lose" as he battles Red Bull's Sebastian Vettel for the title at Sunday's Brazilian Grand Prix. Alonso is 13 points behind Vettel ahead of the final race of the season, and must finish at least third to have any chance of overhauling the German. "We need to try to be on the podium and wait for the result of Red Bull because it is not in our hands," said Alonso. "We have nothing to lose. We can only win, and we will try to do our best." For Alonso to win the championship, he needs to win the race at Sao Paulo's Interlagos circuit with Vettel no higher than fifth, be second with Vettel lower than sixth, or be third with Vettel 10th or lower. The Spaniard said the pressure was more on Vettel because of their respective positions. "In F1 there is always pressure," Alonso said. "Definitely we have less than some occasions and less than if we were leading the championship. "We arrive in second position after five or six qualifying sessions dominated by Red Bull when we were around positions seventh [or] eighth, so recovering 13 points looks like a very difficult achievement. "If everything is normal we will be maybe seventh [on the grid] and if something happens we can win the championship. As it is not in our hands the pressure is much less." And although Ferrari have some upgrades here in Brazil, Alonso said there was little hope of the team improving their car enough to challenge Red Bull and McLaren for a position at the front of the grid. "There is no magic part we can put in the car in five days, so we were seventh [on the grid] in Abu Dhabi [three weeks ago], we were ninth in Austin [last week], so those positions are normal here, but hopefully we can do a better job." Reigning champion Vettel said he would try not to think about this race as being the title decider. "The secret is to take it as any other," he said. "You get the same amount of points as any other race and we are here to attack. We are in a good position but we have to be sharp and ready to attack. "It is sport and anything can happen. We need to look after ourselves, go step by step and try to do everything to make sure we do the maximum result. Historically we have been quick here but is also a place where lots of things can happen, so we need to be sharp in the moment and take away what we can get." The forecast is for rain over the weekend, especially on Sunday. "Weather-wise it is Sao Paulo," Vettel said. "It is the same as if you go to Spa - things can happen quickly, the weather changes a lot. "I spoke to some locals and [they said] two days ago there was some big rain that wasn't expected. "Probably for Saturday and Sunday there is some rain on the way but we don't know how much and when. "I asked [tyre supplier] Pirelli yesterday if they have all the containers with the rain tyres and that's the case, so I don't think we have to be concerned." First practice: midday GMT, 11:55 on Red Button, 5 live Sports Extra and online. Second practice: 16:00 GMT, 15:55 on Red Button, 5 live Sports Extra and online. Final practice: 13:00 GMT, 12:55 on Red Button, 5 live Sports Extra and online. Qualifying: 16:00 GMT, 15:00 on BBC One and online. Race: 16:00 GMT, 15:00 BBC One, 15:45 5 live Sports Extra and online. Race highlights: 19:00 GMT, BBC Three.